We may have another low in this bear but there are continuing signals of new leadership forming. See the chart at the bottom. Before any significant shift from a bear-market to a bull-market, some sectors and asset classes start leading the way up. This phenomenon is called a "positive divergence". Divergence, because the diverging group no longer moves together with the overall market, and positive, because after a long negative and down period, the diverging group turns positive. In the beginning, such divergences may not be obvious, but if over time (several months), the divergence keeps extending its distance from "the pack", and if it starts expanding in its breadth (additional assets join the diverging group), this should be interpreted as a significant development. When you read the financial news, the negatives are overwhelming. Unemployment rates (a lagging indicator) keep rising. S&P500 average earnings keep dropping (so PE's are higher). Home prices keep dropping. Inventories of unsold homes reached records not seen since data began in 1968. 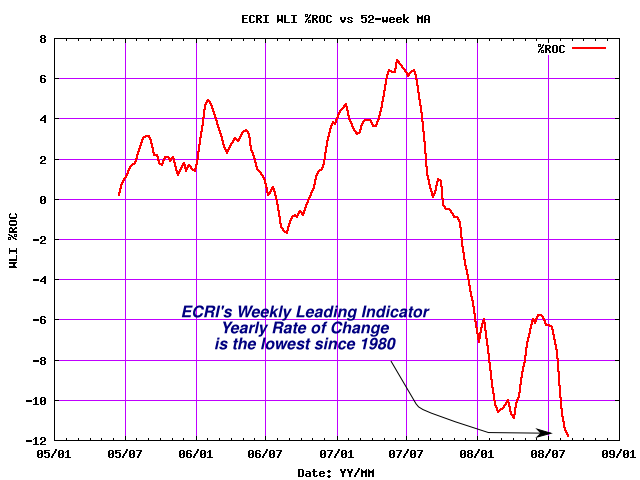 ECRI (The Economic Cycle Research Institute) Weekly Leading Indicator (WLI) annual rate of change (ROC) has just hit a fresh 28 years low at -11.8 (See chart below). Big financial firms keep de-leveraging, writing off more assets, making lending standards stricter, cutting dividends, and trying desperately to raise more capital at a time where credit spreads widen. Worldwide earnings slowdowns coupled with high interest rates in many Emerging and European markets are an ominous sign for these markets. US personal incomes dropped 0.7% for the month. Actually, after taxes and adjusting for inflation, real disposable incomes fell 1.7% for the month, the second straight very sharp drop. The GSE's (Fannie and Freddie) seem to have fumbled the chance to raise capital and now this capital looks much more expensive. So what's to like in this picture? Let's start with home prices. The S&P Case-Shiller US home price index for June (published Aug 26), some of the metropolitan areas are showing a dramatic stabilization in the year-on-year numbers: NC-Charlotte is down only 1%, TX-Dallas down 3%, Boston & Denver about 5%. Portland 6%. Of course, Las Vegas with its 29% drop is the news item you usually hear about, but the story always starts with breadth. The double digit yearly drops do not seem to occur everywhere anymore. The weaknes in the Dollar compared to most world currencies, continued to drive US exports which in turn caused a bump in estimated Q2 GDP. US GDP was revised from 1.9% to 3.3% in Q2. More important is what the market is saying since unlike earnings, or unemployment rates, the stock market is the ultimate leading indicator. In these 3 bottoms both the S&P500 and the Dow Jones Industrials have hit lower-lows. Yet, at this point, it is becoming obvious that some sectors, and even more significantly, some broad asset classes are diverging from the pack. In the July bottom, these diverging assets have hit a higher, rather than a lower low. 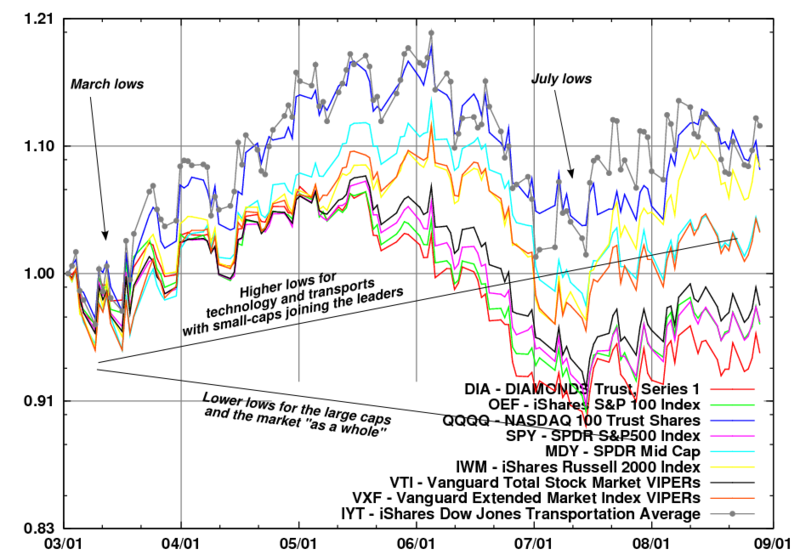 If we look at one sector in particular: the DJ-Transports, the higher-lows trend is even stronger: both the March and the July bottoms in the transports were higher than their January bottom. Sure, it is possible that a some additional waves down are coming and this diverging leadership will give-in and rejoin the pack, But consider that US small-cap stocks started their negative divergence way back in June 2007, about 4 months before the S&500 has peaked and now they seem to be leading in the other direction for the first time in over a year. Time will tell. I believe we may be seeing one more low in the large-caps (and possibly the financials) somewhere this fall. Yet, if small-caps manage to hold above their March lows it would be an additional strong signal that the divergence is real and sustainable. At that point it would be even safer to follow the diverging leaders and buy them, or increase positions, on their dip. I'll let the chart speak for itself. Full Disclosure: Long Dow Transports, US Small Cap (with value overweight), Technology. Partially hedged with a small short position on Europe and Emerging Markets. Working on improving the technique of lightening-up positions on short-term spikes, and increasing positions on short-term dips.